Will Hearst takes his grandpa’s San Francisco Examiner into the ’90s, from the best seat in the place. William Randolph Hearst III is a man who wears suits not because he likes them but because he knows he’s supposed to. He is, after all, editor and publisher of the San Francisco Examiner. His family name has been among the best-known in American journalism since well before he was born, courtesy of his grandfather’s media empire (and, more recently, the 1974 kidnapping of his cousin Patty by the Symbionese Liberation Army). So Hearst, who turns 40 on June 18, is wearing a slightly rumpled but otherwise ordinary gray business suit as he sits reading through stacks of mail piled on a small round conference table in the center of his office. He has been traveling lately and is behind in his reading. An Apple Macintosh computer sits against the wall opposite him, and hanging a bit to its right is a stern-looking portrait of William Randolph Hearst I (who died in 1951) — the two objects together tidily symbolic of the old and new Hearst generations. The newspaper business has changed considerably since Grandpa Hearst took control of The Daily Examiner just over 100 years ago, renamed it the San Francisco Examiner and began drastically boosting its circulation. WRH I’s wealthy father, Senator George Hearst of California, had accepted the paper as partial payment for a gambling debt seven years earlier. WRH I, 23 and recently drummed out of Harvard for behavior that included making certain of his professors gifts of inscribed chamber pots, asked his father’s permission to run the rag — then the worst of the city’s nine newspapers — and became its publisher in 1887. Hearst worked his way up through the journalistic ranks in a hurry. He grew up in New York, attended Canterbury Prep in Connecticut and graduated from Harvard in 1972 with a degree in mathematics (Hearst remains an avid computer buff). At Harvard, Hearst’s view of the Vietnam War clashed with his father’s extreme hawkishness, and he began acting self-conscious about his family’s wealth. Jerry Harrison, a college roommate who now plays keyboards in the rock band Talking Heads, told Vanity Fair in 1985 that Hearst chose to live a Spartan existence in a room furnished with only a second-hand mattress, his math books, a chess set and an alarm clock dangling from a chandelier outlet in the ceiling. Whenever his mother bought him furniture, he gave it to his roommates. Whatever discomfort his family background caused, Hearst nonetheless took a job at the Examiner after graduation. He started out driving a truck and selling ads, switched to general-assignment reporting and eventually became assistant city editor. In 1976, Hearst decided to test his mettle outside the Hearst Corp. Jann Wenner, editor and publisher of Rolling Stone, which was then based in San Francisco, persuaded Hearst to help him launch an outdoor magazine aimed at baby-boomer backpackers and devotees of adventure travel. Hearst and Wenner are said to have chosen the magazine’s name, Outside, while strolling the grounds of the Hearst castle at San Simeon. Hearst was signed on as managing editor of Outside partly because of his name (as was “assistant to the publisher” Jack Ford, son of President Gerald Ford) and partly because of his experience as an adventurer (Hearst was a motorcyclist, a pilot, a horseman, a cross-country skier and a rock climber). His next-in-command, Senior Editor Terry McDonell, helped offset Hearst’s lack of magazine-editing experience. The two remain friends and business associates: Hearst is a contributing editor of Smart, a sort of thinking-man’s magazine that McDonell launched a year ago (it takes its name from the H.L. Mencken aphorism “One smart reader is worth a thousand boneheads”); McDonell has been brought to San Francisco a couple of times by Hearst as a consultant to the Examiner. McDonell and Tim Cahill, a writer who also worked with Hearst in the early days of Outside, both came away from that first contact impressed with Hearst’s intelligence. “He didn’t know the magazine business at all,” Cahill says, “but by the time he left, I would say he was a damn good editor. He was one of those people who could pick up a very esoteric skill like magazine editing very quickly.” McDonell was impressed most by Hearst’s “long reach” as an editor — the ability to pull together relevant information from a wide variety of sources. Something of this knack is evident in the way Hearst sprinkles his conversation with far-flung metaphors. To cite three: He compares newspapers to supertankers (“very slow to change”), the first publisher he worked under to “a gigantic goalie who made sure no really interesting things got into the paper,” and working on a newspaper’s Sunday magazine to blind men grasping at different parts of an elephant (everyone who works on a Sunday magazine has a different idea of what sort of beast he’s dealing with — is it a newspaper, a magazine or a mixture of both?). Hearst’s new job was high-profile without being high-risk. In fact, the Examiner had just gone without a publisher for two years. This was possible in part because of a joint operating agreement signed in 1965, under which the Examiner and Chronicle agreed to share printing and distribution costs. The Examiner agreed to shift to afternoon publication (virtually ensuring that it would never catch the morning Chronicle in circulation), and the papers agreed to split their combined revenues evenly. Under that pact, Hearst could have kept the Examiner profitable by sitting back and doing nothing. Instead, he quickly went abut making over the paper. From the Chronicle, he lured columnist Warren Hinckle, one-time editor of Ramparts and a well-known San Francisco eccentric (he wears an eye patch and never goes anywhere without his basset hound, Bentley). Hinckle went on to win the 1988 H.L. Mencken award as the nation’s best newspaper columnist. Hearst also wooed and won C. David Burgin of the Orlando Sentinel as his new editor, and the two of them added other new faces to the Examiner: Rob Morse was recruited from the Sentinel to go head-to-head with legendary Chronicle gossip columnist Herb Caen; Michael Sragow, late of Rolling Stone and the Boston Phoenix, was signed on as movie critic; novelist Cyra McFadden was given a column in which to poke fun at Marin County morals; and surreal cartoon character Zippy the Pinhead was added to Page 2 (and later moved to the comics page). Frank McCulloch, recently forced to retire as executive editor of the California-based McClatchy Newspapers showed up to interview Burgin for California magazine. Burgin talked McCulloch, now 69 and still with the paper, into becoming his managing editor instead. Hearst also redesigned and renamed the Examiner’s Sunday magazine, Image. Eventually, he would like it to become a San Francisco version of New York magazine (which began, not coincidentally, as the Sunday supplement of the New York Herald Tribune). Hearst has a long way to go on this last project: Image has run some excellent cover stories — a couple of them by Hinckle, who edited it for a time — but there is still a second-rate, Sunday-supplement feel to it. Thompson has, to put it mildly, a reputation for erratic behavior. But he has been meeting his weekly deadlines, and he was the first Examiner columnist to be syndicated since the days of Hearst’s grandfather. (A best-selling collection of Thompson’s columns, Generation of Swine, was published last year.) Thompson has also proved well-connected, having predicted the resignation of Warren Burger as chief justice of the U.S. Supreme Court the day before Burger’s surprise announcement. Thompson’s opinion notwithstanding, Berlin’s series of commercials starring Hearst himself — sometimes talking to the disembodied voice of his departed grandfather — is funny, clever, and irreverent. Most important, the ads have made Hearst’s face among the best-known in San Francisco and enhanced the Examiner’s hard-sought reputation for hipness. Then came another change of editors. 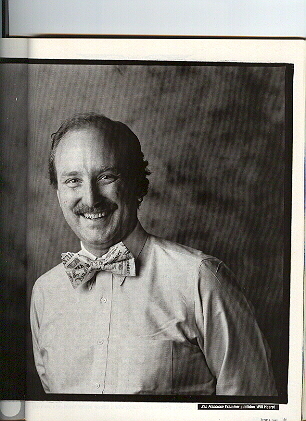 In January 1986, seven months after luring him to the Examiner, Hearst fired Burgin and named himself editor. Larry Kramer, now 38, joined the paper as executive editor the following June. Kramer, who holds a Harvard M.B.A. and had worked with Hearst previously at the Examiner, was assistant managing editor for metropolitan news at the Washington Post and had supervised the creation of the Post’s national weekly. (Ironically, Burgin had tried hiring Kramer as managing editor before bringing in McCulloch.) Kramer has continued making editorial improvements, paying special attention to foreign reporting: Phil Bronstein — since reassigned to Central America — was a Pulitzer Prize finalist in 1986 and 1987 for his work in the Philippines. Burgin, 50, who now edits the Houston Post, is less reticent. Known for his brilliance as an editor and for his fiery temper (one of the Examiner ads shows Burgin storming past his cowering staffers as Hearst tells viewers that his editor’s tough-guy reputation has been “blown way out of proportion”), Burgin rattles off a number of grievances: Hearst, freed by the joint operating agreement from many of a publisher’s normal business duties, had too much time to step on his editor’s toes; Burgin had to get his every move approved by Hearst and didn’t like working that way. Hearst thought Burgin’s management style “too loosey goosey” (Burgin’s words) and wanted things more structured. (Hearst would dispute this last point: “I hate this whole military paradigm for [a newspaper’s] organization,” he says, in a slightly different context. “It stinks. What you really want is more like a university. You want people to have their own expertise and cooperate to produce something larger. But they don’t have this goose-step management thing.”) Hearst wanted to bring an East Coast-intellectual style to the paper; Burgin wanted to have more fun, to take more chances. Hearst wasn’t good at following through on his many ideas. (“He has the attention span of a flashbulb”). Hearst hired Hinckle without consulting Burgin, who cannot stomach him (“I’ll give the guy one symbol,” Burgin says, referring to the eye patch and Bentley the basset hound, “but two? That’s a bit much, don’t you think?”) Hinckle later encouraged Hearst to oust Burgin. Hearst objected initially to some of Burgin’s best acquisitions — McCulloch, Thompson, Zippy — and is now “rewriting history” by claiming credit for them, Burgin says. Despite his litany of complaints, Burgin — like most observers — considers the Examiner a much better paper since Hearst became publisher. Of course, that might not be saying much. “The newspaper situation in San Francisco 10 years ago was the laughingstock of American newspapers,” says media critic Ben Bagdikian, a professor at the University of California at Berkeley’s Graduate School of Journalism. 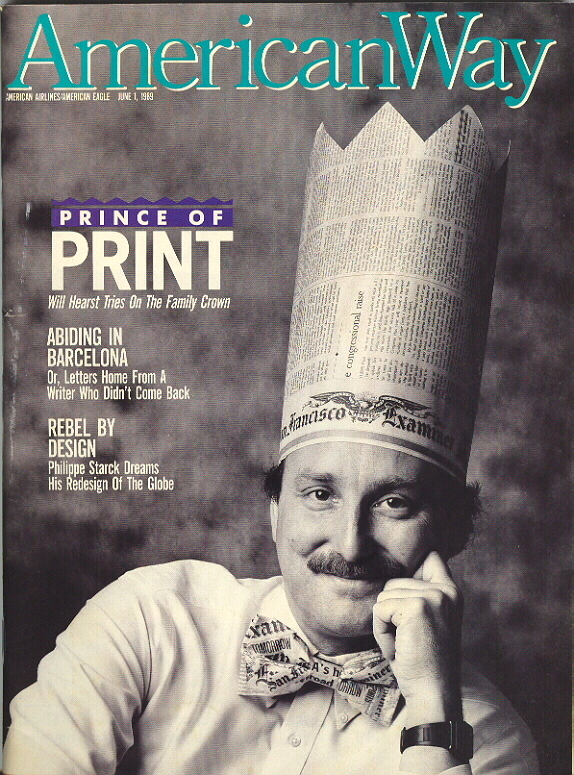 While most city dwellers would be loath to admit it, Bagdikian says that “probably the best [newspaper] in the Bay area is the San Jose Mercury News.” Still, Bagdikian agrees that “Will has made an enormous improvement.” Bagdikian notes that the Chronicle and the Examiner are now very different papers. “The Chronicle sees itself as a regional paper. The Examiner pays a lot of attention to the city, but at the same time it’s not a parochial paper. It does cover national and international news.” Bagdikian calls Hearst’s attempt to lure advertisers by appealing to upscale, educated readers ”making the best of a tough situation” — television news having usurped much of the audience for afternoon newspapers. Hearst Corp. management is no doubt paying close attention to Hearst’s efforts. And while Hearst says he doesn’t plan to leave the Examiner anytime soon, it is assumed that he is being groomed to run the billion-dollar Hearst publishing empire (whose holdings include newspapers, magazines, book publishers, television stations, cable networks, and the King Features Syndicate). When asked whether his career plans extend beyond the Examiner, Hearst jokes about not having any career ambition whatsoever, then decides against being facetious. “I’ll give you a more sincere answer,” he says, and proceeds to do so, complete with one final drawn-out metaphor. “This kind of work is really hard to give up, because you’re high enough up in the organization that you can make things happen, but you’re still close to a real newspaper, to a real product. You know, the guys I work for, the unit of management for them is a whole newspaper. They don’t live in any of these cities; they operate on an administrative level entirely.